When I visited Caryl Bryer Fallert a few weeks ago she showed me a system she uses to help hold the weight of the quilt she's working on. She modified the quilt cradle she bought from Carole LeRoy at Pain-free Quilting. The cradle has a 2-piece wooden part that attaches to your table. There are two screw-eyes that go into the horizontal arm of the cradle. A length of nylon cord is strung through each screw-eye and a toggle. One end of each cord is tied to a quick-release clamp. 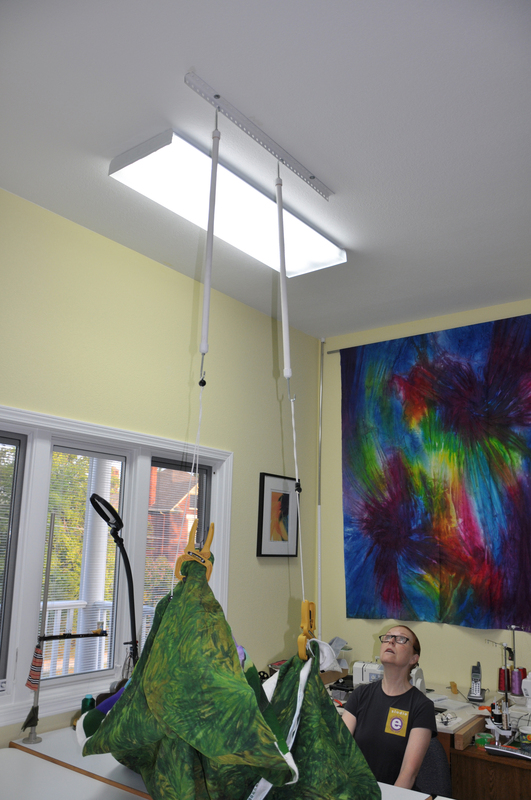 Caryl decided that, since she never moves her machine, it was easier to suspend the clamps from the ceiling. So what you see in the photo is a piece of angle iron in Caryl's ceiling. There are two rods that have a hook in each end. A nylon cord is hanging from each of the lowest hooks. The little black 'button' is the toggle. The clamps are holding up the quilt she is working on. Well, if it's good enough for Caryl it is very definitely good enough for me! I don't move my sewing machine either so Steve put two screw-eyes into the ceiling over my machine where I thought they would work best. 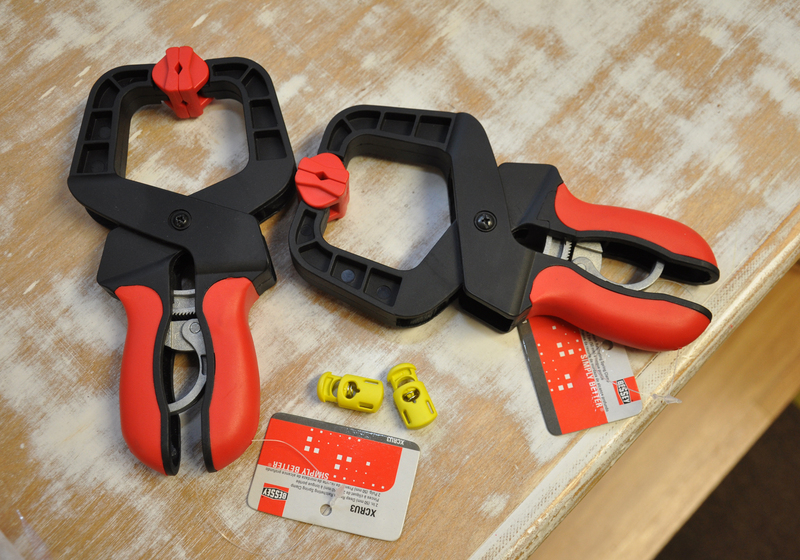 I found the yellow toggles when I was in Australia and the quick-release clamps came from Lowe's. The nylon cord I used is the same type that you buy for roman shades. The toggle squeezes the cord, holding the clamp in place. If you squeeze the toggle to release the pressure on the cord, you can raise and lower the clamp to the height you need. Here are my quilt clamps in use. Caryl was right – lifting this weight off the table does make it easier to move the quilt around. The clamps are clean and you can decide how much pressure to put on your quilt. This style of clamp does not require much hand strength to use. The quilt cradle kit offered by Pain-free Quilting is very reasonably priced and the beauty of it is that you don't have to chase down the various parts of the system – they come to you in one box.